"Christmas night" redirects here. For the album by the Cambridge Singers, see Christmas Night. A similar tradition (Wigilia, or 'Christmas Vigil') exists in Poland. The number of dishes used to be traditionally an odd number (usually 5, 7, 9, or 11.) According to the Słownik etymologiczny języka polskiego (Etymological Dictionary of the Polish Language) by Aleksander Brückner, the number of dishes was traditionally related to social class: the peasants' vigil consisted of 5 or 7 dishes, the gentry usually had 9, and the aristocracy, 11 dishes, but the even number 12 is also found today to remember the 12 disciples. It is obligatory to try a portion of all of them. Some traditions specify that the number of guests cannot be odd. 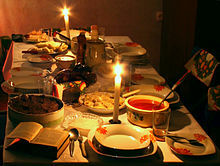 In Russia, Ukraine traditional meatless 12-dishes Christmas Eve Supper is served on Christmas Eve before opening gifts. The table is spread with a white cloth symbolic of the swaddling clothes the Child Jesus was wrapped in, and a large white candle stands in the center of the table symbolizing Christ the Light of the World. Next to it is a round loaf of bread symbolizing Christ Bread of Life. Hay is often displayed either on the table or as a decoration in the room, reminiscent of the manger in Bethlehem. The twelve dishes (which differ by nationality or region) symbolize the Twelve Apostles. 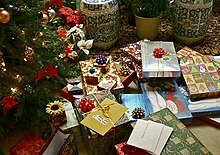 In Argentina, Austria, Brazil, Bulgaria, Colombia, Denmark, Estonia, the Faroe Islands, Finland, France, Germany, Hungary, Slovakia, Iceland, Latvia, Lithuania, Luxembourg, Norway, Poland, Portugal, Quebec, Romania, Uruguay, Slovenia, Sweden, Switzerland and the Czech Republic, Christmas presents are opened mostly on the evening of the 24th – following German tradition, this is also the practice among the British Royal Family since it was introduced by Queen Victoria and Albert, Prince Consort – while in Italy, the United States, the United Kingdom, Republic of Ireland, English Canada, South Africa, New Zealand and Australia, this occurs mostly on the morning of Christmas Day. 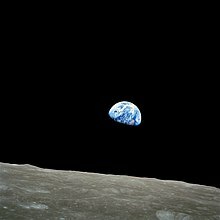 On 24 December 1968, in what was the most watched television broadcast to that date, the astronauts Bill Anders, Jim Lovell and Frank Borman of Apollo 8 surprised the world with a reading of the Creation from the Book of Genesis as they orbited the moon. Madalyn Murray O'Hair, an atheist activist, filed a lawsuit under the Establishment Clause of the First Amendment. The trial court dismissed the lawsuit, which was upheld on appeal. ^ Christmas as a Multi-faith Festival—BBC News. Retrieved 24 November 2011. ^ "Christmas is here- yet again!The Holy Land is unique in celebrating Christmas three times; on December 25th, January 6th and January 19th". JPost. ^ Ramzy, John. "The Glorious Feast of Nativity:? 29 Kiahk? 25 December?". Coptic Orthodox Church Network. Retrieved 17 January 2011. ^ "COME AGAIN? Why do Orthodox Christians have Christmas Day on January 7 and how does the date vary around the world?". The Sun. ^ Mary Pat Fisher (1997). Living Religions: an encyclopedia of the world's faiths. I.B.Tauris. ISBN 9781860641480. Archived from the original on 29 October 2013. Retrieved 29 December 2010. Christmas is the celebration of Jesus' birth on earth. ^ "Christian Calendar". Jerusalem Center for Jewish-Christian Relations. Archived from the original on 23 July 2011. Retrieved 29 December 2010. ^ Bible - NIV. 2005. ^ "Vatican Today". Retrieved 29 December 2010. ^ "Woman knocks Pope down at Christmas Mass". British Broadcasting Company. 25 December 2009. ^ "Feast of Seven Fishes – A Sicilian Christmas Eve Tradition". Rachael Ray Digital LLC. 2014. Retrieved 14 November 2014. Sicilians traditionally celebrate Christmas Eve with a "Feast of Seven Fishes" which was historically served after a 24-hour fasting period. Although pre-Christmas fasting is not a popular custom still practiced by Italian-Americans, many still enjoy a meatless Christmas Eve feast. ^ Kasprzyk, Magdalena. "The 12 Dishes of Polish Christmas". Culture.pl. Retrieved 3 August 2016. ^ "12, 11, 9? Ile dań na Wigilie? - Święta". polskieradio.pl. 19 December 2010. Retrieved 14 February 2014. ^ "Wigilia". Polishcenter.org. Archived from the original on 24 February 2014. Retrieved 14 February 2014. ^ Kubilius, Kerry (2017). "Lithuania Christmas Traditions". www.tripsavvy.com. Retrieved 22 December 2018. In pagan Lithuania, the Christmas celebration as we know it today was actually the celebration of the winter solstice. ^ "Lithuania, Christmas in". Retrieved 22 December 2018. Hundreds of little Christmas Eve formulas and charms offer Lithuanians ways in which to use the events of this evening to predict the future. ^ Grinevičiūtė, Monika (December 2018). "Magical Christmas Eve in Lithuania - Kūčios". Retrieved 22 December 2018. One more important thing - it is believed that during the Christmas Eve all family members are coming together to have dinner. It means the deceased relatives as well, so for that reason on the table one more, additional plate, is always placed. ^ "Lithuanian customs and traditions". thelithuanians.com. Retrieved 22 December 2018. The ritual supper is not eaten until the evening star appears in the sky. Until then, the bathhouse is heated, people bathe and dress up in festive clothes. The floor was strewn with juniper by the mistress and the master placed handfuls of hay on the table, covered it with a white linen tablecloth. ^ "2/10/2011 Lithuanian traditions: Christmas". www.lithaz.org. Retrieved 22 December 2018. The meal served on Christmas Eve did not include meat, milk products or eggs. ^ "Lithuanian customs and traditions". 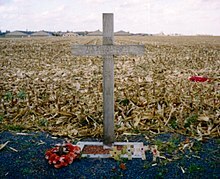 thelithuanians.com. Retrieved 22 December 2018. Most often the "Kūčia" table was not cleared away, for it was believed that when the family is asleep the souls of the dead come in to eat. ^ Vaicekauskas, Arūnas (2014). "Ancient Lithuanian Calendar Festivals" (PDF). Vytautas Magnus University. p. 31. Retrieved 22 December 2018. The cult of the dead is well noticed in the custom when, after Christmas Eve supper the table is not cleared but left overnight. It was believed that the souls of the dead would come and serve themselves at night. ^ "Queen Victoria's Christmas - A 'chandelier Christmas tree' and family gifts go on display for the first time". Royal Collection Trust. 30 November 2012. Retrieved 25 December 2016. ^ Hoey, Brian (12 December 2014). "How the Royal Family do Christmas". Wales Online. Retrieved 25 December 2016. ^ Gluck, Robert (20 December 2011). "What young Jews do on Christmas Eve". Los Angeles Jewish Journal. Retrieved 30 December 2018. ^ "Christmas Eve parties now a Jewish tradition". 24 December 2006. Retrieved 25 December 2017. ^ Ren, Yaoti (14 November 2017). "China's love for Christmas apple gifts". Retrieved 26 December 2018. ^ "The Apollo 8 Christmas Eve Broadcast". NASA National Space Science Data Center. 25 September 2007. Archived from the original on 19 April 2008. Retrieved 12 April 2008.